Round Sapphire and Diamond Engagement Ring with Pave Setting | Shane Co.
Twenty-eight round, pavé set diamonds, at approximately .28 carat TW, are accented with 22 round, pavé-set sapphires, at approximately .25 carat TW in this cutting edge split shank engagement ring. These stunning gems are crafted in quality 14 karat white gold, and the total gem weight is approximately .53 carat. Add the center stone of your choice to personalize this unique look. I absolutely love my ring, I get complemented all the time. The sapphires really make the diamond “pop”, I catch myself staring at it all the time. Both my fiancé and I have September birthdays, so having our birthstone in my ring made it the perfect ring! I have gotten so many compliments on this ring! the center can accommodate a larger stone so we are able to upgrade on our anniversaries! 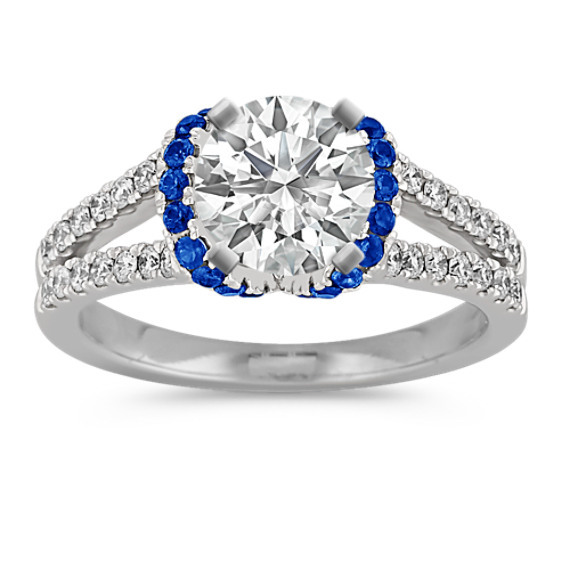 This ring is simply elegant. It is such an unusual piece! I love having something that truly looks one of a kind. the sapphires make such a statement. delicate and eye catching.